A devastating earthquake all but leveled Christchurch’s older buildings in February, however Shigeru Ban just unveiled a massive temporary cardboard building that will replace the city’s historic cathedral exactly one year after the quake. The ambitious cardboard church will hold 700 people and it can be erected in a matter of months to help the city with its healing process. The church is just the latest example of Ban’s groundbreaking cardboard architecture, which creates high quality temporary shelters using humble cardboard tubes as the main structural supports. Ban was asked to design a large church that could be quickly erected to help normalize the shaken community. The triangular roof is made from locally produced cardboard tubes of equal lengths that are set at progressively changing angles to add interest to the roofline. The entrance will be filled with stained glass windows, which Ban suggested could be fabricated by local artists. The base of the building will be composed of shipping containers. The cathedral is scheduled to open on February 22nd, 2012 — the one year anniversary of the 6.2 magnitude earthquake that claimed 181 lives. The $4 million building can be deconstructed and repurposed for other needs when a permanent church is built, showing the how versatile and long-lasting the building technique is. 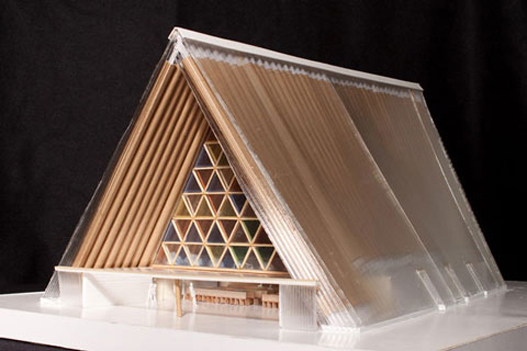 A devastating earthquake all but leveled Christchurch’s older buildings in February, however Shigeru Ban just unveiled a massive temporary cardboard building that will replace the city's historic cathedral exactly one year after the quake. The ambitious cardboard church will hold 700 people and it can be erected in a matter of months to help the city with its healing process. 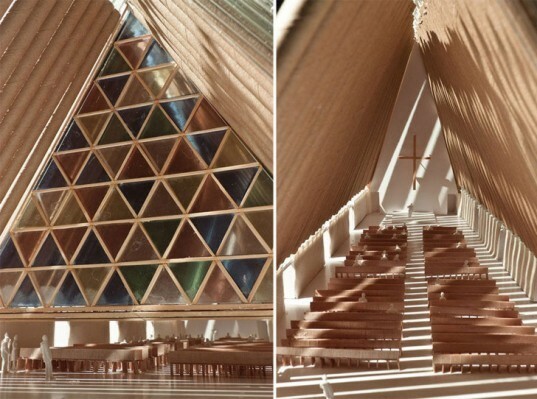 The church is just the latest example of Ban’s groundbreaking cardboard architecture, which creates high quality temporary shelters using humble cardboard tubes as the main structural supports.